When it comes to network security, many users and administrators are running scared and justifiably so. The sophistication of attacks against computer systems increases with each new Internet worm. What's the worst an attacker can do to you? You'd better find out, right? That's what Security Warrior teaches you. Based on the principle that the only way to defend yourself is to understand your attacker in depth, Security Warrior reveals how your systems can be attacked. Covering everything from reverse engineering to SQL attacks and including topics like social engineering, ant forensics and common attacks against UNIX and Windows systems, this book teaches you to know your enemy and how to be prepared to do battle. 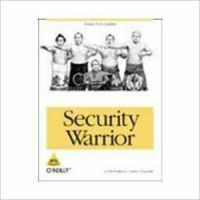 Security Warrior places particular emphasis on reverse engineering. RE is a fundamental skill for the administrator, who must be aware of all kinds of malware that can be installed on his machines trojaned binaries, "spyware" that looks innocuous but that sends private data back to its creator and more. This is the only book to discuss reverse engineering for Linux or Windows CE. It's also the only book that shows you how SQL injection works, enabling you to inspect your database and web applications for vulnerability. Security Warrior is the most comprehensive and up-to-date book covering the art of computer war: attacks against computer systems and their defenses. It's often scary and never comforting. If you're on the front lines, defending your site against attackers, you need this book. On your shelf and in your hands. Dr. Cyrus Peikari is currently the Chief Technical Officer of Airscanner Corporation, a leading mobile security software company. He personally holds several patents in the anti-virus and infosec fields. In addition to numerous radio and television appearances, he is a popular speaker at technology and network security conferences. He has co-authored four bestselling security books, two of them as lead author including Maximum Wireless Security, Windows .Net Server Security Handbook and Windows Internet Security. Dr. Anton Chuvakin, Ph.D., GCIA, GCIH, GCFA is a recognized security expert and book author. He currently serves as a Director of Product Management with LogLogic, a log management and intelligence company, where he is involved with defining and executing on a product vision and strategy. He was previously a Chief Security Strategist with netForensics, a security information management company. He is an author of a book "Security Warrior" and a contributor to "Know Your Enemy II", "Information Security Management Handbook" and "Hacker's Challenge 3".